Home ABOMINATIONS What happens when the Yellow Vests meet European Debt Crisis II? The stock market, real estate, luxury goods, corporate debt and government bond bubbles, and other lesser bubbles, all jockey for the titles. It’s the “Everything Bubble” for good reason. The “good reason” is: the 1% owns everything of high value, so if Western governments make it their policy to inflate those valuations even higher, then the 1% regains everything they lost in 2008. Welcome to Western Liberal Democracy – if you have a seat in the House of Lords I’m sure you’re not suffering too badly. Because of that “good reason” I listed all of these bubbles are worse now than in 2008. Nothing was learned and nothing was delivered: I am not a doomsayer, but these kinds of facts make me write that Great Recession II (Great Depression II?) is around the corner. The luxury goods bubble, for example. It’s mildly interesting, from a sensational news aspect, that the most expensive bottle of wine is now worth $558,000…but the luxury goods market is a minuscule part of every nation’s “real” economy, excepting France, Italy and Switzerland. Back in 2008 a half-million dollars set the record for largest lot of wine ever – 27 bottles – so these stories only prove the existence of huge asset inflation (bubbles) – 1/27th in the area of wine sales. The stock market bubble is also mainly a rich-person’s problem – we only hear about it so very often because…the rich own the media in the West, and the coverage thus reflects their interests. Yes, 52% of Americans own stock, because it’s a huge part (stupidly, rapaciously) of the American private pension system, but only 18% own stock directly and can buy and sell at will. We all know that stocks no longer have any correlation to a company’s actual performance and prospects; those really paying attention also know that the Great Recession’s bailout money has been used for stock buybacks, which raise the stock price. That bubble is ending, too: taxpayer-funded stock buybacks were higher than ever in 2018 and yet produced the worst market results since 2008. This now-failing tactic of buybacks is the source of the “corporate debt bubble”. The stock market bubble’s bursting is not that important to the everyday person, no matter how much media coverage will be devoted to it – the real economy will not not sink because of it, no matter how much less your 401k pension is now worth. The related corporate debt bubble is far more impactful: instead of using that cheaply-borrowed money from the government to hire or for R&D, corporations are thus not prepared for capitalism’s next inevitable crisis, which translates into layoffs, which translates into a huge “real economy” hit as workers are not buying lunch, paying rent or buying decidedly non-luxurious but still-necessary goods. The real estate bubble affects many more people, and not just in the construction market. Just over 50% of Germans are homeowners, rising up to 70% as you get in the former Socialist Bloc nations, with the US around 65%. Amazingly, home prices have surpassed the prices in 2008 in the US. But it’s rarely remembered that houses are only worth what a bank will loan you to pay for them. Banks are getting money from governments cheaply, but instead of “real economy” investments they inflate houses (which they own) with incorrect valuations. When credit is so low that borrowing is near free, why not pay yourself more? So that means more dumb loans have been dangled and signed. When this bubble bursts it will hurt but it won’t bring the entire economy to a total halt. As a daily journalist who deals with housing activists regularly, let me pass this on to you – there are few mass problems easier for the government to fix than housing. Housing oversupply in the US is back to 2007 levels? Why aren’t the homeless and poorly-housed rejoicing? Because in the West housing policy is controlled by real estate speculators, lenders and landlords – not dwellers/citizens. Your country lacks (mainly low-cost) housing supply (like France and the US)? Again, the stroke of a pen creates a fabulous, real-economy and real quality-of-life-boom for your citizenry. But…not in capitalism. Think China is wrong to build “ghost cities”? I say lay off the propaganda: you are wrong to imagine that construction doesn’t move faster than government bureaucracy. Check those ready-made planned towns in 10 years – they always get filled up with Chinese “peasants” eventually. The bond bubble, however, is the mother of all bubbles. That’s because the most important actor in any economy is the government. Can’t borrow, like Greece? Then you wind up…like Greece. It takes a US government shutdown for The “socialism for the losers” New York Times to say what all lower and middle-class people know: government jobs are the best ones. The Times is right: no government jobs/cutbacks, then no more lunches at Rayetta’s Lunch Box but brown-bagging instead; no jobs for Blacks/Muslims, then it’s back to their two low-paying choices in private industry, depending on gender – janitor/security or receptionist; austerity cutbacks or shutdown-cutbacks indeed means “three families that would be getting above-average pay” won’t get it, with huge consequences on the local and national levels – reduced overall economic activity. So I am not falsely trumpeting the virtue of “big government” when I note that if/when Eurozone governments cannot borrow money via bonds, and thus cannot fund their daily operations, then the economic output of those individual nations will plunge drastically. Government workers will likely work for free for months, as in Greece and elsewhere, mainly because they are patriots who also have nowhere else to go. They can’t become private sector waitresses because Ravetta is actually about to close the Lunch Box down – government workers have no money to lunch there, so it’s now near bankruptcy: If the public sector dies, it will take much of the private sector with it. If national governments can’t get money, can the European Central Bank – the higher-level-but-not-really level of government in the Eurozone – step in? No, the ECB is tapped out and on the verge of becoming a joke – they can no longer buy government bonds or help banks replace this role which the ECB has served for years. They failed because they did not attach any strings to bailouts, thus never fundamentally strengthening a weakened economy burdened with a poor governmental structure. Macron will not do what it takes to gain credibility with the Yellow Vests – admit that all of France’s and the Eurozone’s policies have failed and have also been morally wrong. The post-2009 taxpayer bailouts for failed banks, we were told, were supposed to not just save Ravetta’s Lunch Box but to help open Ravetta’s Lunch Box II, creating jobs and circulating wealth in the real economy. There were no formal promises or strings necessary, we were told – banks would just do the right thing on their own. The reality is that post-2009 banks jealously guarded their taxpayer bailouts, and refused to lend. That money went into the various 1%-benefitting bubbles. The ECB then lowered their interest rates all the way to zero, giving commercial banks zero risk to borrow money which could be then lended to Ravetta. This means that failed investments were taken off the books of private banks, with the failures assumed by taxpayers, and now the private banks were even being staked with money. Banks, knowing how bad the Eurozone’s situation truly was, didn’t bite – they borrowed but didn’t lend. That borrowed money went into the various 1%-benefitting bubbles. That caused the ECB to try something else in 2015 – QE. The ECB tapped a keyboard and created 2.5 trillion bitcoins out of thin air – wait, not bitcoins, but 2.5 trillion euros. This money went to buy something banks didn’t want (for obvious reasons) – government bonds – but also some private sector bonds. By taking the problem of unwanted national sovereign bonds out of the picture Eurozone QE, the theory went, would also keep private banking interest rates low. That means they could give loans to corporations and the small- and medium-sized Ravettas, finally creating economic growth. The Eurozone is a currency area, not a country – QE had plenty of problems and entanglements which the US and Japan did not have. But what it did have was, again, no promises or strings attached. Much of the money went into the various 1%-benefitting bubbles. However, QE did temporarily solve the problem of sovereign debt in the Eurozone by taking it on its own books and keeping it off the books of the member nations. This has allowed member nations to look attractive to investors – too bad that investors never invested in the real economy! The fake economy – stocks, Van Goghs, real estate, etc. – has been booming for 10 years, after all. Now that QE is ending, the reality is that the bond issue was not solved because there is no one who can replace the role of the ECB: nobody can or will buy Eurozone bonds at the same level…and thus how will governments be funded? This is the main problem caused by the end of QE. So despite 10 years of public funding, banks never forwarded any of this money to Ravetta. It should be totally clear that what banker bailouts, zero-interest lending and QE did for the Eurozone was simply to free up high finance to: 1) fund stock market buybacks to prop up the stock market 2) to inflate (non-productive) corporate debt, 3) make risky and overvalued loans to prop up values in the real estate market, 4) create the profits which the 99% never sees but which fuel sales in the luxury goods market. The “solution” was Mario Draghi’s 2012 “Whatever it takes” speech, which translated on a practical level to Quantitative Easing, i.e. no-strings attached, near-free taxpayer money to the 1% and high finance in order to stop them from squeezing the national bond markets of the Eurozone as they had started doing. The US and Japan had embarked on QE sooner and more deeply. The first proof of this is that the Eurozone has achieved a Lost Decade of economic growth (average annual growth rate from 2008 to 2017 was just 0.6%.) – which the media never admits but which I detailed – despite nearly four years of QE worth 2.5 trillion euros. Money was only injected into the 1%er economy, and the second proof of this is that we now have Real Estate Bubble II, Stock Market Bubble II, Luxury Goods Bubble II, etc. Only Eurozone Government Bond Bubble II has not appeared…because when it does, by definition, all hell will break loose. The government, socialists understand, is the ONLY backstop from disaster – capitalists falsely believe it is the SOURCE of disaster. To say that I am wrong about why the European Debt Crisis will not start soon – given the withdrawal of high finance-pampering – is to say that capitalism is not “capitalism” but that it is a centrally-planned, regulated, protective, riches-limiting socialism instead; is to say that high-finance has found morality and wants to make money honestly; is to say that international neoliberal capitalists have rediscovered fraternal patriotism. The Eurozone’s QE, after postponements, is now done. It was supposed to be finished in September of 2017, which is why I wrote this 7-part series about it back then, but it was postponed and prolonged with a QE2 until December 2018. The US and Japan have also had multiple rounds of QE. Maybe at the first sign of Eurozone Sovereign Debt Bubble II they will announce QE 3, but that would require a changing of their rules – the ECB is not as independent as the US Fed or the Bank of Japan, after all. It is very likely – given the horrifically slow nature of the EU’s 18th-century Liberal Democratic system – that the rules will not be changed in time, given the fact that QE 3 would come amid such a very worse economic and bubble situation than QE 1 or QE 2. Just imagine the effect any major economic shock and subsequent slowdown will have on the Yellow Vests – what if unemployment goes from 9% to 11%? The Yellow Vests are marching every Saturday because they want immediate improvement, not a dramatic worsening. How would they respond to the 1%’s faux-solutions to an economic shock? Are they going to sit back and hold their tongue in order to placate the “confidence fairy”? Are they going to put their faith in the campaign promises of a patsy like Francois Hollande? Are they going to “give a chance” to a candidate who is even more last-minute and even more falsely fabricated than Emmanuel Macron? Are they going to take a chance on Marine Le Pen, even though they firmly rejected her in 2017? The answer is no. The answer is: we don’t know what the Yellow Vests will do on any given Saturday. Even if Macron does break down and end austerity completely, that will require more borrowing. That means the 1% and their supporters – like Reuters – will cry foul over the same old absurd all-deficits-are-bad fears, and raise borrowing rates (bond rates) as well. 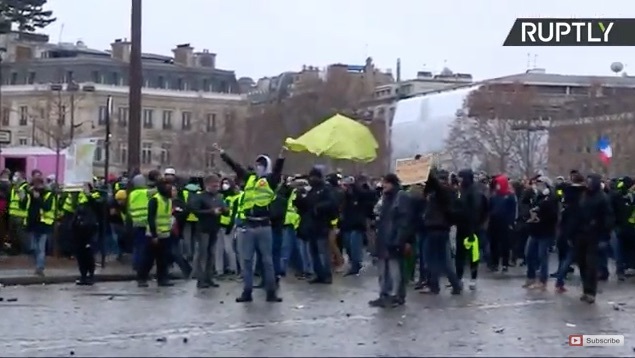 If Macron continues on his path, that means more poor economic performance, which means more Yellow Vest supporters. That is certainly what he will do: in the first cabinet meeting of the year he instructed cabinet minsters to be “more radical in their attempt to reform the country” – i.e. continue with real economy-crushing reforms to the unemployment and social security systems in 2019. This might keep France’s bond rates low, but France is in the Eurozone – French success is tied to keeping Italy’s, Spain’s and everyone else’s bond rates low as well. As the 2nd-largest motor in the Eurozone France’s economic stagnation heightens the risk of all their Eurozone partners. The Eurozone is not the US or Japan, and certainly not China: It only takes one nation – in the context of multiple bubbles caused by 10 years of terrible economic policies, which are in place to paper over 30 years of terrible economic policies – to bring the Eurozone back into crisis with higher bond rates. So higher bond rates are inevitable, it’s just a matter of when. High finance already knows all this: This week saw Latin American bank bonds become less risky than Eurozone bank bonds, which hasn’t happened since 2012. How long until they move to Eurozone nations? Where the French are at now is: zero tolerance. That’s a very intelligent place for the masses to be, given the recent history I’ve recounted. The Yellow Vests are calling January 19th “Act 10”, which has reached the point of absurdity. I realize that the French have a culture which overwhelmingly stresses the visual, aesthetically-concerned aspects of culture – painting, fashion, acting – but revolution is not theater. 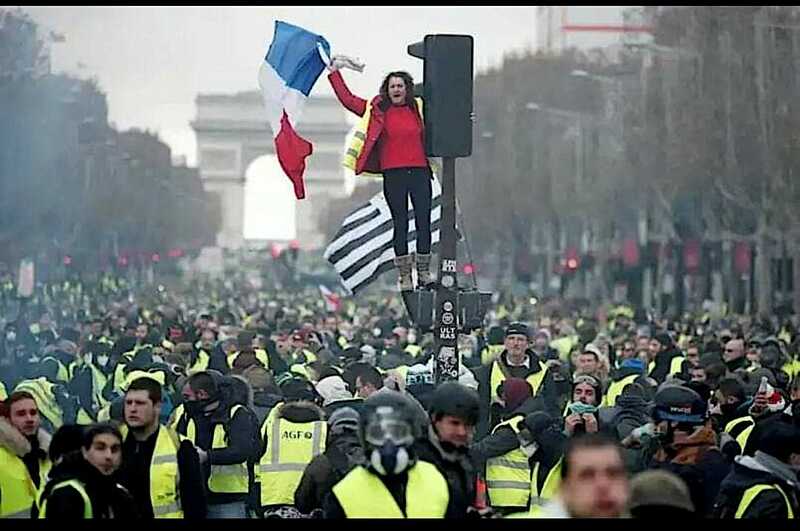 Are the Yellow Vests going to have “Act 324” one day?! Leftist revolutionary political change is not a pose, nor a role, nor a shirt to put on, but a permanent and committed determination. Regardless for how long France wants to persist with these theater-inspired slogans, Sovereign Debt Crisis II will make permanent believers out of the Yellow Vest. 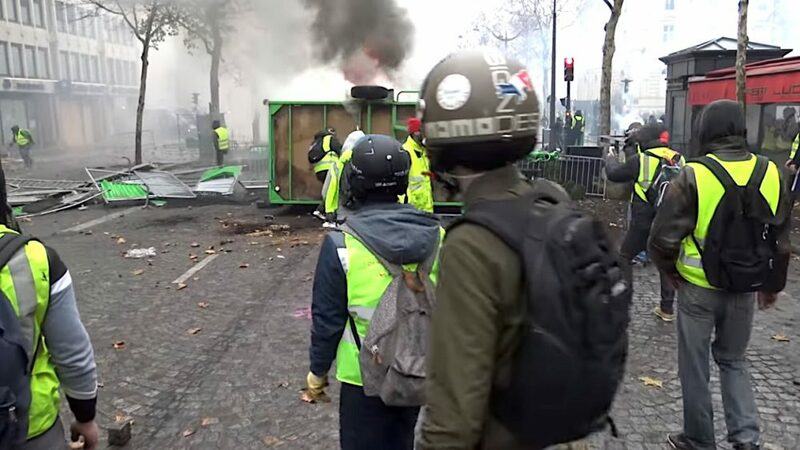 Don’t look at the Yellow Vests in an isolated vacuum – the only thing “new” about the Yellow Vests is purely sartorial (how very French): It’s just 1 protest…which has lasted 8 years. Times have changed: The Yellow Vests were not on the ground in 2008. Nor will the response to economic recession/crisis be like in 2012, when France continued to put their faith in a mainstream politician – Francois Hollande. Indeed, with the Yellow Vests mobilised so well I say this: let the bubbles burst and the crisis hit as soon as possible – it would be far better in the long run.